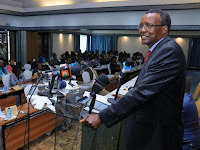 Friday February 1, 2019-Chief Justice, David Maraga, has finally yielded to pressure about the way the Judiciary was handling corruption cases. This is after he convened a meeting on Friday with Court of Appeal President, William Ouko, and all principal and presiding judges to address matters corruption. Maraga partly blamed the magistrate for the delay in prosecuting graft which has led to constant blame games between the courts and the Directorate of Public Prosecutions (DPP), Directorate of Criminal Investigations (DCI) and the Ethics and Anti-Corruption Commission (EACC). As a result of these blame games, Maraga added 10 more magistrates to the anti-corruption court with a specific mandate to finalise all the pending cases. He also mandated all the magistrates in the anti-corruption court to sit beyond working hours to fast track the cases.